The poetry book of the year is here! It’s been five years of reading and writing and thinking about poetry and potatoes and now we have collected these poems into one book. The book includes Maltese poems translated to English, Dutch and Frisian and also poetry by Dutch writers translated to other languages. It also includes recipes, experiences and photos, namely that by Maltese photographer Giola Cassar. The Maltese editor of this edition is Claudia Gauci. Join us for the book launch that would not have been possible without the cooperation of a lot of people from different walks of life. 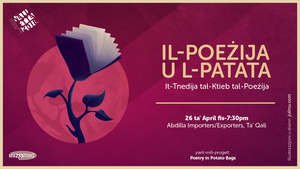 The book launch will be held on the 26th of April at 7.30pm at Abdilla Importers/Exporters, Ta’ Qali. During the launch you will listen to a number of poems, a local band club and get to taste some good wine. On the night we will also premier the film being produced by Kenneth Scicluna; a film that looks at the whole process involved in importing and exporting potatoes and also this project. The film also features Froukje De Jong without whom this project would not have been possible. This project is a collaboration between Valletta 2018 and Inizjamed together with Leeuwarden 2018. Below find a link to the map for the location. The place is located at the end of Triq l-Idward in Ta’ Qali, right behind the American Embassy.